Get your PADI in 2019 - learn to dive with Dive Academy and experience a world of underwater adventure. The PADI Open Water Diver course is the world's most popular scuba diving course and has introduced millions of people to an exciting new lifestyle. PADI Open Water Diver - the way the world learns to dive! If you've always wanted to take scuba diving lessons, experience unparalleled adventure and see the world beneath the waves, this is where it starts. Get your scuba diving certification with the PADI Open Water Diver course - the world's most popular and widely recognised scuba course. Millions of people have learned to scuba dive and have gone on to discover the wonders of the aquatic world through this course. Using the PADI e-learning system, you'll be able to learn academics at your own pace using a computer connected to the internet, or download it to an Apple or Android tablet for offline completion. You'll work through five sections introducing you to diving equipment, skills, problem management and the natural world. Multiple choice assessments as you go help you to track progress through the course. When you come into Dive Academy for your pool training we'll begin with a quick review of academics and then complete a practical session to understand how to assemble, put on, and disassemble a scuba unit. We'll then complete five pool dives together, and also teach you skin diving skills. You do need to be able to swim - during your first session we will ask you to undertake both a 200m swim (no time limit, but without stopping) and a 10 minute float or tread water. You'll complete four dives with a PADI Instructor to put into practice what you learned in the pool. You'll repeat skills in Open Water to demonstrate your competence to dive independently to up to 18 metres with a similarly qualified buddy and qualify as an Open Water Diver. We recommend that all students who plan to dive in the UK complete the PADI Dry Suit Diver qualification alongside the Open Water course. This allows divers to enjoy year round diving in the beautiful British waters. You'll complete dry suit theory, an additional pool orientation session and a fifth open water dive. For student safety and comfort we only offer Open Water training in wetsuits from May to October. In the PADI Open Water Diver course, you'll learn to use basic scuba gear including a mask, snorkel, fins, regulator, buoyancy control device and a tank. The best way to learn to dive is in your own, professionally fitted high quality scuba diving equipment. 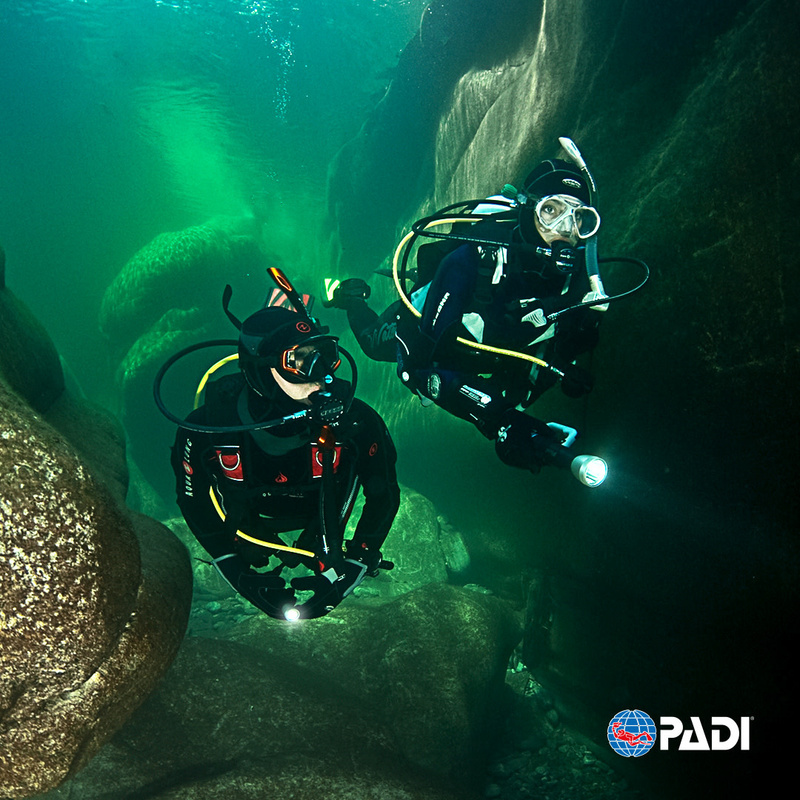 Students who purchase their own equipment before completing Open Water Dives or immediately afterwards tend to dive more and become better divers. However if you are not able to purchase your own equipment prior to your qualifying dives we can supply all items at no extra charge. Your instructor will be able to help you identify the correct equipment for you. For students undertaking the PADI Dry Suit Diver course, a high quality drysuit and Fourth Element Arctic undersuit is supplied. Participants should be aged 12+ and in reasonable physical health. There is a medical questionnaire all participants will be required to complete on the first day. Please check the PADI Medical Questionnaire before booking and contact us if you have an YES answers prior to booking. If you have all NO answers please go ahead and book your chosen date. Scuba diving is a physical activity and can be tiring. You should arrive for your training sessions well rested. Where your course takes place on consecutive days, it is unwise to arrange other activities in the evenings as you will likely be tired and will need to rest before the next day's training. Next you'll move on to PADI Advanced Open Water. You don't need to be Advanced to complete this course - you can even do it straight after Open Water if you want to. Over five dives with an instructor you'll work further on your dive skills and undertake activities such as navigation, wreck diving and drift diving. 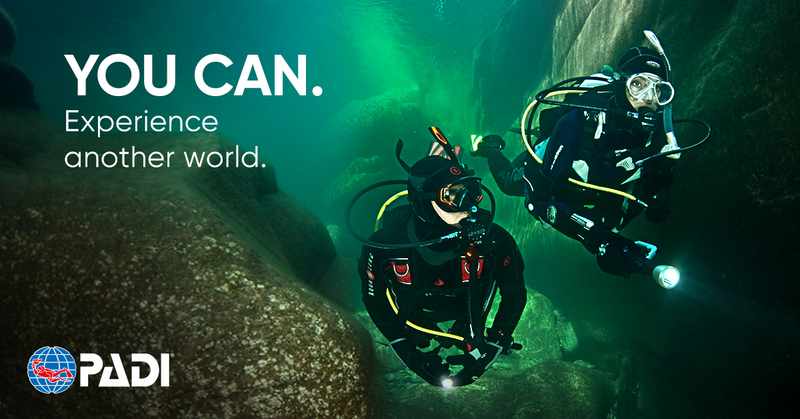 You could get your PADI and be a qualified scuba diver in just a few weeks. Book your chosen date above today and we'll be in touch with your learning materials to get you ready for your scuba diving adventure.